Sunglasses make more than a fashion statement — they also keep your eyes safe from the sun’s harmful ultraviolet (UV) rays. That’s why choosing the right sunglasses is an essential part of keeping your eyes healthy. UV rays can raise your risk of developing eye diseases such as age-related macular degeneration (AMD), cataracts, and even cancer of the eyes and eyelids. Ultraviolet light is a form of radiation and alters cells. UV damage is cumulative, so protection must begin early in life, even though the damage may not be apparent until many years later. You can search for best sunglasses for men like Ray Ban sunglasses online from reliable e-retailer. Sunglasses can many times function as a visual aid, as variously termed spectacles or glasses exist, featuring lenses that are coloured, darkened or polarized. Here we have listed below some helpful tips for choosing effective sunglasses. Look for sunglasses that effectively block 99 to 100 percent of UVB and UVA rays. Do not choose sunglasses based on the darkness or colour of the lenses. Unless treated, the dark lens does not block out UV rays better than other tints. Read the label instead. When it comes to sunglasses, bigger is better. Wrap-around shades that offer side protections are especially good choices. The sun’s rays do not just come from the front. They can reflect from surfaces like cars or the water. Cat Eye sunglasses are the best sunglasses for women. If one does a lot of driving or boating, consider polarized sunglasses, which are effective at reducing glare. Sunglasses have a rich and long history but most of us see them as a modern invention designed to protect the eyes from the sun. 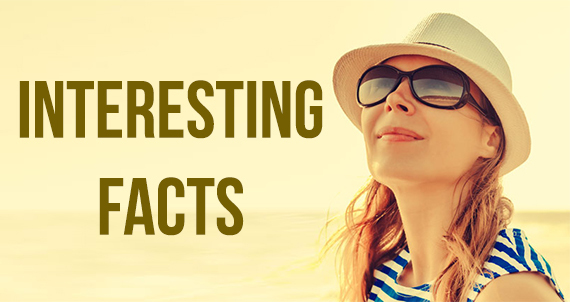 Here are ten interesting facts about sunglasses that you probably didn’t know that will completely change your view on the world of sunglasses. The debate on whether eyebrows should show when wearing sunglass is unresolved. Many think it is a matter of face shape; others view the presence of eyebrows above the glass rim as a heinous crime. There appears to be no right answer. The Chinese of 12th Century are credited with inventing the first sunglasses, both to protect the eyes from the glare of the sun and to completely hide their facial expressions in the court of law. The ideas behind sunglasses are much older, however, with the first examples being Inuit snow goggles. These were designed to decrease the amount of eye exposed to the sun’s rays. The Roman Emperor Nero is reported to have watched Gladiator fights in the Coliseum through polished emeralds. British singer Elton John is commonly known for his love of wacky sunglasses. So much so that he even inspired 1998 play ‘Elton John’s Glasses’. It is no surprise then that Elton John is thought to own the largest personal collection of sunglasses in the world at around 30,000 pairs. Polaroid sunglasses offering UV protection were invented as early as 1936. Before that time, tinted glasses just reduced the glare and amount of sunlight exposure to the eye. The achingly famous and fashionable Ray-ban Aviators a la Top Gun are a product of science, not fashion. Ray Ban sunglasses were originally designed for US Air Service pilots by medical equipment manufacturers Bausch and Lomb and were intended to reduce sickness and headaches caused not by the glare from the sun but from intense hues of the sky at high altitude. They mainly used the above mentioned Polaroid technology and a green tinted lens to create them. American rock bank ZZ Top in 1980 released a single called ‘Cheap Sunglasses’. 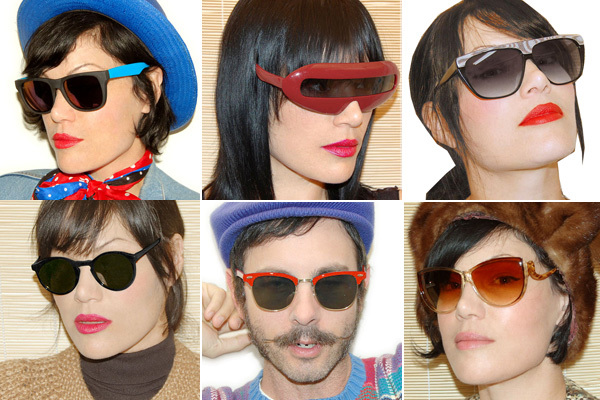 Sunglasses commenced to filter into the US mass market in 1929 and by late thirties, were considered a cool accessory. Life Magazine, in an article about growing popularity of sunglasses, estimated that only around 30% of those purchased were worn to protect the beautiful eyes. The rest, like today, were mainly considered a fashion accessory. Just one Luxury Goods Company produces 75% of the world’s designer sunglasses. Labels such as Chanel, Burberry, and Ralph Lauren are all designed and made by Italian company Luxottica and they also own Oakley and Ray-ban brands. Cheap round sunglasses can be just as good at blocking harmful sun rays as expensive sunglasses, but more expensive sunglasses tend to combine all of the protective technologies required for complete eye protections, including eliminating specific frequencies of the light for use in specific conditions. As you can see, there is so much more to sunglasses than meets the eyes. In recent times, sunglasses are a must-have accessory and almost everybody owns at least one pair. Thanks to big marketing budgets and product placement, the names of some glasses, like Aviators, are in common everyday usage. You can buy sunglasses online from online stores like LensPick at a reasonable price. These days, those in the know are looking for smaller, more out-there brands to differentiate from the mass market fashions. What type of sunglasses wearer are you?